Ventricular Septal defect is a hole in the heart, precisely in the interventricular septum of the heart. It is a congenital heart defect, a structural abnormality in the heart present right from the birth. Interventricular septum is a wall that separates lower two chambers of the heart (ventricles). Under normal circumstances, there is no communication between the right and the left ventricles thereby preventing mixing of pure and impure blood across lower two chambers of the heart. However, some babies are born with structural abnormality in the heart (Congenital heart defects). In VSD, there is an abnormal communication channel or opening in the septum, the wall separating both ventricles. Hole in the heart has a tremendous impact on the blood flow through the heart and functional efficiency of the heart is severely compromised. If you are seeking VSD closure surgery for your child, in India. You are at the right place! HealthcaretripIndia is affiliated with the best heart hospitals of India that have already received high volume of heart patients from all over the world and have successfully treated them as well. We do understand the cost concern you might be facing and trying hard to find high quality heart treatment or heart surgery to be precise, for your child, that too at an affordable cost. 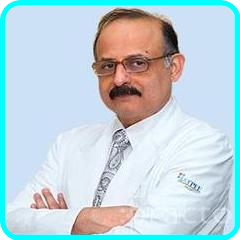 HealthcaretripIndia, is a medical tourism service provider that not only helps you connect to the world class best hospitals of India and gets you everything, all under one roof, for heart surgery or any other medical treatment, for that matter, but also makes sure that you get the best treatment for your child at the lowest cost possible. Scan and send us your child's medical reports at contact@healthcaretripIndia.com or contacthealthcaretripIndia@gmail.com to be able to get you expert medical opinion from the top pediatric heart surgeons at best cardiac hospitals of India, on the best treatment for your child and cost estimate for the same. Q1 What are congenital heart defects? A2 VSD, Ventricular septal defect is a congenital heart defect that is characterized by a hole in the interventricular septum of the heart. Interventricular septum is a wall that separates right and left lower chambers of the heart(ventricles). In structurally normal heart, there is no communication between right and left side of the heart. They are separated by a wall or septum which prevents mixing of the oxygenated and deoxygenated blood. However, in VSD, due to the presence of a hole or opening in the wall that separates both ventricles, pure(oxygen rich) blood in the left ventricle mixes with impure(deoxygenated) blood present in the right ventricle thereby putting more work load on the right side of the heart. Now, right side of the heart has to push more blood through it. Furthermore, pure blood, instead of going through the great artery, Aorta, to supply oxygen to all the tissues of the body, is pumped back to the lungs from where it came back a moment ago. All this factors have an impact on the resulting heart function. Q3 What are the different types of VSDs? Child heart surgeon usually takes size of the ventricular septal defect into account to better understand its outcome and the treatment plan. Small VSDs usually do not cause any concerns, close on their own and therefore do not call for surgery. However, medium and large holes produce signs and symtoms in an infant or a child and need to be surgically closed. Membranous ventricular septal defect characterized by a hole or defect in the membranous part of the interventricular septum, which is near the heart valves. The hole can close spontaneously, at any time. Muscular ventricular septal defect is found in the lower muscular part of the septum. Most of them spontaneously close any time in the early childhood. Inlet ventricular septal defect, as the name suggests, are located on the septum near the site where the blood enters the ventricles. These VSds are less common than the above two. Outlet ventricular septal defect, the rarest of all the above VSDs, is located at a site on the interventricular septum which is near the exit of the blood from the ventricles. Q4 What are the complications of ventricular septal defects? Q5 What are the signs and symptoms associated with hole in the heart (VSD)? A5 Presence of heart murmurs, often right after birth, in most of the babies. It may be the first or the only sign of VSD. However, there may be times, when the murmur is not apparent until the baby is 6 to 8 weeks old. In case of medium or large VSDs, the symptoms and signs of heart failure ensue and these will appear in the first 2 months of the baby's life. VSDs, other than the above, usually do not cause heart symptoms in babies. Signs and symptoms of ventricluar septal defects are rare after first year of life or infancy because either they spontaneously close on their own, decrease in size or are surgically repaired in the 1st year of the baby's life. Poor feeding and failure to grow are two major signs of the heart failure in babies. Q6 Does VSD occur in adults? A6 Yes. VSD may occur in adults as a result of heart attack or surgery. Q7 What does "Hole in the heart" mean? A7 Abnormal, unusual opening or communication channel between right and left chambers of the heart is referred to as Hole in the heart. Normal heart structure is characterized by completely separated right and left side of the heart. Right and left atrium are separated by interatrial septum, whereas right and left ventricles are separated by interventricular septum. Septum is a partition or wall between the chambers. When the opening is in interatrial septum, the wall separating right and left upper chambers of the heart(atria) it is known as ASD(Atrial Septal Defect). Opening in the interventricular septum, the wall between right and left lower chambers of the heart(ventricles), is referred to as ventricular septal defect. Both of these come under the umbrella term "Hole in the heart". VSD is the most common hole in the heart whereas ASD comes next after. It is imperative to mention here that the hole in the heart does not mean that the blood is leaking out of the heart into the chest cavity. It is a hole in the wall separating the right and left side of the heart which results in mixing of the oxygenated(in left chambers of the heart) and deoxygenated blood (in right chambers of the heart). Q8 How is hole in the heart, diagnosed? A8 The Pediatric heart specialist does the clinical examination of the child patient and runs some tests to come to a diagnostic conclusion regarding the underlying heart condition that needs attention. During clinical examination, he does the general well being examination as well as heart specific examination such as evaluation and assessment of growth in the child, nutritional status, chief complaints as told by the care giver of the child, generally parents or the signs pointing towards heart related abnormal condition or signs of a congestive heart failure(CHF). Chest examination is done to look for abnormal heart sounds or murmurs. Q9 What is VSD closure surgery? Intracardiac Surgery: Most commonly used surgery. It is an open heart surgery and a heart-lung bypass machine is used to substitute for the work of heart and lungs during the operation. A small tissue from the outer lining of the heart, pericardium, is taken and stitched to cover the abnormal unusual opening in the wall separating lower two contracting chambers(ventricles) of the heart. Catheter technique: Here a flexible tube or catheter is used to close the hole. This procedure is carried out in the catheterization laboratory (Cath Lab). Q10 ​What is Eisenmenger's syndrome? A10 Eisenmenger's syndrome is one of the complications of long standing, untreated congenital heart defect that is characterized by an abnormal communication channel or hole between right and left chambers of the heart. 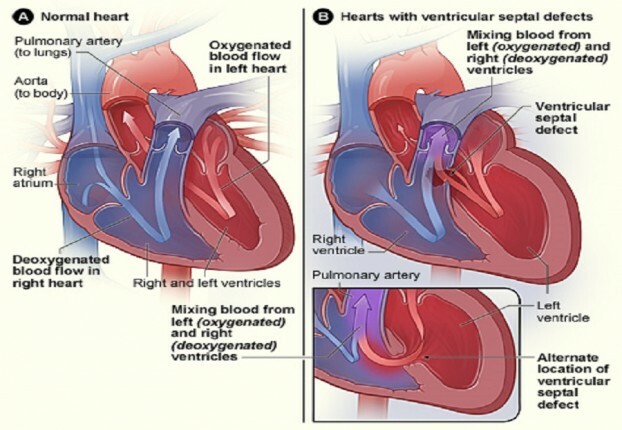 Initially the pure oxygenated blood from the left side of the heart mixes with the impure blood in the right side of the heart and instead to going to Aorta, the artery that supplies oxygen rich blood to all the tissues of the body, it goes back to the lungs through artery to the lungs(Pulmonary artery) emanating from right lower heart chamber(ventricle). Significantly increased blood flow to the lungs slowly and gradually makes the arteries to the lungs stiff and narrow thereby increasing blood pressure in them(Pulmonary hypertension) which eventually changes the direction of flow of blood from right side of the heart to the left side of the heart. (opposite direction to what it was initially). The blood vessels to the lungs are damaged for good. "Left to right shunt(abnormal communication and blood flow)" has now changed to "Right to left shunt". Eisenmenger's syndrome ensues when the pressure in pulmonary arteries(arteries to the lungs) exceed to an extent that causes reversal of blood flow across the heart chambers. Finally, the impure oxygen deficient blood from the right side of the heart flows into the left chamber of the heart and from there it is transported to all the tissues of the body. It causes bluish discoloration of skin and oxygen supply to the tissues is severely hampered. It is important to know that it is a life threatening condition and should be carefully monitored and treated. Q11 What is meant by restrcitive and non restrictive VSD? A11 Restrictive and non restrictive classification of ventricular septal defect is used on the basis of size of the VSD which inturn determines the amount of blood flow through it. Restrictive VSDs are characterized by small openings that allow no or little blood from through them from the left side to the right ventricle of the heart. Non restrictive VSDs are characterized by moderate to large sized openings that allow generous amount of blood flow through them from left to the right ventricle of the heart. Q12 Who are the specialists involved in VSDs diagnosis and treatment in children? A12 Doctors who specialize in diagnosing and treating heart conditions in children are referred to as Pediatric Cardiologists. Those doctors who treat heart conditions in children through surgery are referred to as Pediatric Cardiothoracic Surgeon or Pediatric Cardiac Surgeon. Q13 What is the treatment of VSD(Ventricular Septal Defect)? For some VSDs that do not cause any symptoms of heart failure in the child and are small in size, specialist may decide to observe the child and check him clinically and at regular intervals, for a certain period, to see if the VSD closes on its own or reduces in size. Generally, more than half cases of VSDs close on their own. Good nutrition: Nutritional requirement is highly increased as children with VSDs tend to have impeded growth and development. They even fail to gain weight. Such children have usually large VSDs, had a premature birth and get exhausted easily while feeding. Nutritional supplementation is recommended. This special high calorie feeding is given until the time of surgery, as surgery is a viable treatment option in symptomatic children. Q14 How is life after VSD repair or closure surgery? A14 For all those who have undergone VSD repair or closure surgery, fortunately, they can lead a normal healthy and active life post surgery. However, in few patients, Arrhythmia or residual VSD may occur. only when the surgery is delayed. Residual VSD happens when there is leakage at the edge of the patch of the tissue used to close the hole. Rarely, they call for another surgery. Usually, they are small and do not cause symptoms. Prophylaxis with antibiotics: Infective endocarditis, IE, is a possibility in chidren with heart defects. Infective endocarditis is the infection and inflammation of the inner lining of the heart. So, in order to prevent it from occuring, it is recommended to take a course of antibiotics before any medical or dental procedure. High quality and the most advanced heart surgeries and trans catheter cardiac interventions, at the most affordable cost. High success rate with remarkably good results in VSD heart surgery. World class hospitals with state of the art infrastructure. 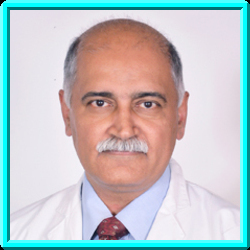 Globally trained and highly experienced Pediatric Cardiac surgeons in carrying out the procedure with competence and ease. Hospitals accredited with international organizations such as JCI(Joint commission International) or its Indian equivalent NABH (National Accreditation Board for Hospitals and Healthcare providers) for quality standards. Most economical accommodation available at a walking distance from the hospital. Wide range of options starting from guest house, service apartments to five star hotels, best suited to your budget and choice. India has a diverse and rich cultural heritage. You can witness its beauty and uniqueness. It offers most conducive environment for recuperation. 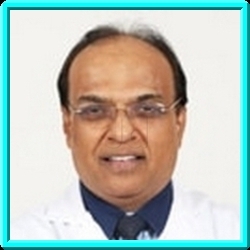 I would like to extend my gratitude to the entire team of HealthcaretripIndia for their exemplary care given to my father during his treatment in India.